Tmac presents a teachable moment analyzing the time play in Los Angeles Thursday night. This is an interesting time play. 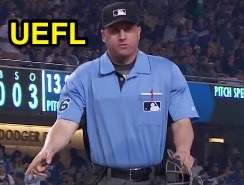 Too often, I see umpires so anxious to signal time plays with two outs in situations that never actually happen (i.e. runner on 2nd and two outs). At higher levels, a large number on time plays actually occur with one out.... How is this possible? 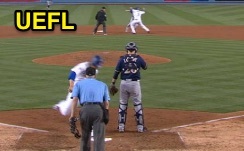 Lets take a look at this play from Thursday's Milwaukee Brewers-LA Dodgers game. One out, runners on 1st and 3rd, and we have Ryan Blakney working the plate and the umpire at 2nd for the call is Crew Chief Mike Everitt. A fly ball is hit to left field that should easily score the runner from 3rd, but we have a crafty runner from 1st that is trying to get into scoring position with two outs. The 3rd base umpire goes out on the play leaving us in a 3-umpire system. Luckily we have a thoroughly engaged plate umpire who is not caught unaware that there a time play developing and he is in a straight line from the back of home to 2nd base for his best possible angle. Blakney scores the run and while there was no angle that clearly showed whether the tag came before or after the runner touched the plate he was emphatic in scoring the run. What makes this play even more difficult is the resulting play at second. Everitt, who is the 1st base umpire at the beginning of this play has a runner standing, not sliding into 2nd and the tag occurs on the outfield side which makes Blakney's view blocked. Essentially, this is a play that was handled really well by the umpiring crew and I thought it should be brought to light. In addition, who doesn't like hearing Vin Scully's voice!